In recent years, the public view of “street drugs” has shifted considerably. This is best represented by the transition from the 80’s “Just Say No” campaign to the recent decriminalization, and even legalization, of marijuana for the treatment of a myriad of disorders. Tetrahydrocannibinol (THC) and respective 113 other cannabinoids contained in marijuana have no recorded lethal dose and have demonstrated therapeutic potential in biological assays and clinical trials. In fact, synthetic THC (Marinol) gained FDA approval in 1986 for nausea and AIDS-related anorexia, despite the natural product remaining a schedule I substance. There is no doubt that THC is a therapeutic but from a medicinal chemistry perspective, it would be desirable if we could harness the therapeutic effect, improve it, and decrease the psychoactivity. This has led researchers to investigate the other cannabinoids present in marijuana, along with creating libraries of synthetic cannabinoids to ultimately treat neuropathic pain, anorexia, nausea, seizures, and anxiety. The psychoactivity attributed to marijuana is due to activation of the cannabinoid receptor-1 (CB1) while many of the therapeutic properties associated with cannabinoids can be attributed to activation of the cannabinoid receptor-2 (CB2). CB2 agonists are not scheduled, and remain unregulated and thus the world’s fascination with cannabidiol (CBD) was born. While I specialize in medicinal chemistry, my first love will always be biomimetic total synthesis, and cannabinoids are excellent scaffolds to create via this approach. Because of the phenolic rings, they can be synthesized efficiently, asymmetrically and regioselectively through dearomatization to quinone methides and often without the use of protecting groups. 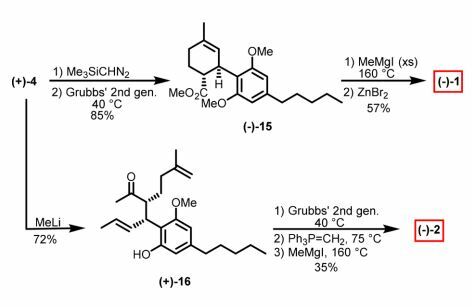 A recent publication out of the James Leahy’s group describes a gram-scale synthesis of cannabidiol that utilizes an Ireland-Claisen rearrangement as it’s key step to access the natural product. I’ve never been a fan of using enzymes in synthetic pathways (for no real good reason other than I don’t think enzymes belong in synthetic routes) but the authors state that the enzymatic approach is scalable and inexpensive, which would be preferable over expensive chiral catalysts. However, the real highlight of the publication is that the pathway focuses on synthesizing a common intermediate (4) which can then be used to make either THC (1) or CBD (2), and presumably a library of analogues. The most fascinating therapeutic property (in my opinion, anyways) associated with CBD is its demonstrated ability to reduce addictive behavior for opiates, tobacco, and alcohol. Initially, I was reluctant to hop on the CBD bandwagon, because like many I wasn’t convinced that the nutraceutical would really ever translate clinically without further design. This changed in 2016 when I had the privilege to see a presentation by Yasmin Hurd where she presented clinical trial results of CBD administration for opiate addiction. The results were astonishing with a highly significant reduction in addiction seeking behavior (In actual humans, btw), and a reduced rate of relapse long term. Interestingly, treatment with THC reinforced addiction seeking behavior and potentiated relapse. Maybe CB2 agonists are really worth the hype. This is so interesting, TK–a short (and fun) commentary on recent work on CBD! Reminds me of myself!